Buy Morse Drum Trucks to move and position drums in your facility. These Morse drum trucks have trim, tough, all steel, welded construction for strength. Morse drum trucks provide you with ease of use at a low price. Simply place the Morse drum truck upright along side your drum, engage the upper rim hook, and tip back to load and move your heavy drum. Morse drum trucks have trim, tough, all steel, welded construction for strength. They provide you with ease of use at a low price. Morse 2 wheel drum truck models have trim, tough, all steel, welded construction for strength. Each Morse drum truck provides you with ease of use at a low price. A Morse drum truck is a different device than a platform hand truck. Engage the upper drum rim with the chine hook, then pivot back to fit the two "toes" of the drum truck under the curvature of your drum to support it. "over pack" or "salvage drum"
The design of these Morse 2 wheel drum trucks reduces freight cost, but requires mostly easy assembly. Assembled dimensions: 61.25" (155.6 cm) long, 25.25" (64.1 cm) wide Can ship via UPS. The design of Morse models 152, 153 and 155 2 wheel drum hand trucks allows them to be shipped partially unassembled to save on freight cost. This savings requires mostly easy assembly, but retains all the features and capacity of our original drum hand carts. This Morse drum truck stands by itself for space saving storage. It is light in weight but still tough enough to handle a 1000 Lb. (454 kg) load. A footrest helps in loading and supports a loaded drum truck. It rolls easily and quietly on 10" x 2.5" (25.4 x 6.35 cm) rubber mold-on wheels. The design of Morse drum hand trucks lowers freight cost and requires a mostly easy assembly. Assembled dimensions are: 62" (157.5 cm) long, 25.25" (64 cm) wide. You can handle and store this drum truck upright, in pushing position. The drum truck handle hinges outward to give added leverage for easier moving and steering. Two 8" (20.3 cm) polyolefin wheels and one 4" (10.16 cm) diameter swivel caster give excellent control. 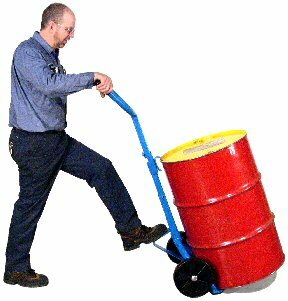 To get a drum onto the No-Spill Drum Truck, push the top of the drum to slightly tip it away from you, push the base under the drum with your foot, then release the drum to rest on the No-Spill Drum Truck.